Tesla Model S early adopter and one of the first Tesla-focused YouTubers, KmanAuto, is back with another death-defying Autopilot versus human test. This time pitting his Model S against friend and serial test dummy Mike Anthony who rides a bike directly into the path of the moving two-ton electric sedan. The experiment conducted by Kman and Mike is in response to a recent article that claims Tesla Autopilot will kill bikers. Through a series of tests that involved driving a Model S between 18 mph (29 kph) to 30 mph (48.28 kph) directly into Mike while he’s on a bicycle, Kman aimed to disprove any notion that Autopilot acts erratically and will collide with bikers. The vehicle being used in the test was a Model S with Autopilot 1.0 hardware on firmware 8.1 (17.11.10). Autopilot and Autosteer was enabled on all tests. 18mph (29 kph) vs. human on bike perpendicular to the car. 25 mph (40.23 kph) vs. human on bike perpendicular to the car. 25 mph (40.23 kph) vs. stationary bike facing the oncoming car. 25 mph (40.23 kph) vs. bike traveling in the same lane as the car. 30 mph (48.28 kph) vs. bike traveling in the same lane as the car. 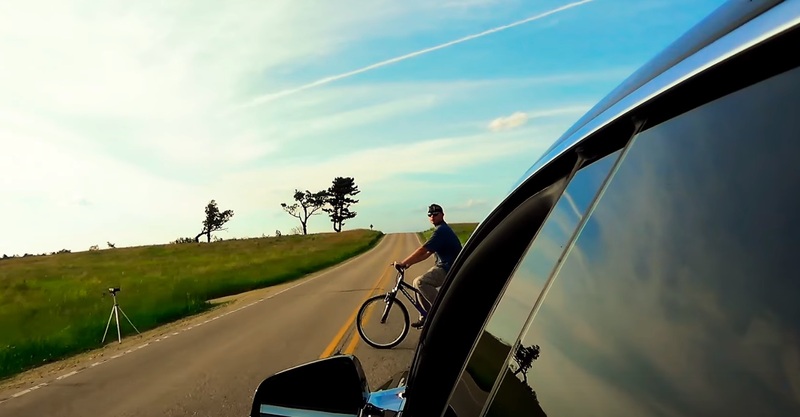 Watch as Kman and Mike demonstrate Tesla Autopilot’s reaction to bicyclists. We’ve also included Mike’s heart attack-inducing video below which provides a first person vantage point. According to Kman, Autopilot is not a fully autonomous system but has a remarkable collision avoidance feature. He noted that Autopilot 2.0 on Tesla’s Vision system with 8 cameras and an array of radar and sonar sensors will only help Autopilot continue to improve over time, and until it exceeds the capabilities of the original Autopilot. “I’d need to say the only way Autopilot will kill bikers is if the driver of the car is drunk, completely distracted (Mis-Using Auto-pilot as if it were Full Autonomous) or asleep. Used as designed, it will SAVE lives.” says Kman.